The Earth Lodge was a typical structure used as a shelter or house style that was built by many Native Indian tribes who lived in harsh climates without large forests, such as the grass covered prairies of the western plains. Learn about the structure and the interior of the Earth Lodge with pictures and images together with facts and information about the tribes who used them, including the Mandan, Arikara, Pawnee, Omaha and Osage Native Indian tribes. 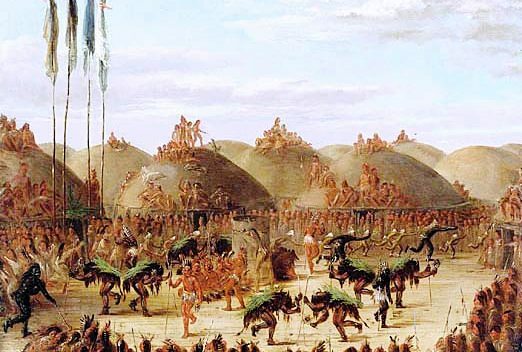 The picture shows the Mandan tribe performing the Bull Dance by their Earth Lodges was painted by George Catlin. What does the term Earth Lodge mean? Definition: The Earth Lodge was a large, strong, circular dwelling that was constructed with a log frame covered with smaller branches or other plant matter, then packed with mud or sod (turf) and covered with woven tule mats. The tribes who built earth lodges lived a life based on agriculture and buffalo hunting. Some tribes, like the Pawnee built their homes in a more pointed, oval shaped design without a covering of tule mats. There were two types of Native Indian houses referred to as Earth Lodges. The identical, distinctive style of cone-shaped houses in farming villages that were built over bluffs and near the crops and the earthen houses built by tribes such as the Pawnee that were built on the plains. The same name was used by early writers and historians to describe completely completely different structures, regardless of the tribes who lived in them, their locations and the materials used to build them. Who lived in a Earth Lodge? The Earth Lodge was generally used as a shelter and home by some of the Native Indian Tribes who inhabited the grass covered prairies of the western plains. The names of the tribes who lived in the Earth Lodge style shelter included the Omaha, Mandan, Osage, Arikara, Pawnee, Otoe, and Hidatsa people. They planted the 'Three Sisters' crops of corn, beans, and squash. As farmers, their earth lodge villages were often built on bluffs over looking a river and near to their fields. In the summer they hunted bison and used Tepees or Tule Mat Lodges as a temporary form of shelter. The villages consisted of between 10 - 100 earth lodges. Their houses were built close together and usually grouped around a central square or plaza where important ceremonies, rituals and dances were performed. Every Earth Lodge was built to house several families plus their dogs. The roofs of the Earth Lodges were a focal point of the people. They were so strong that many people could gather on the rooftops to see what was going on in the village, to do their chores or play games. The Earth lodges in each village were arranged in a pattern that reflected specific star groupings. Shrines to the morning star and the evening star were erected at the far east and far west points of the village. Some Earth Lodges were built specifically for ceremonies and sacred rituals. Some tribes, such as the Mandan and the Arikara built sturdy palisades (fences) around their villages providing protection for the people of the village from attacks by hostile enemies An earth lodge was durable and would last 10 to 15 years, when they would be replaced by new structures. Building an Earth Lodge took cooperation and forward planning in order to prepare the materials required for the construction, collecting wood and elm bark, drying and preparing grasses. The Pawnee tribe lived in the Earthen houses, commonly referred to as earth lodges, that were built by erecting 10 - 15 posts set about 10 feet apart which outlined the floor of the lodge. in a circle, forked at the top, into which cross beams were laid. Long poles were laid against the cross poles and leant from the outside toward the centre. The Pawnee Earth Lodge was then covered with brush and reeds then finally with sods of earth. A smoke hole was left at the top and there was a long tunnel-like entrance at the base which faced the east and the rising sun. A common feature in a Pawnee Earth lodge was four painted poles, which represented the four cardinal directions and the four major star gods. The culture of the Pawnee focused on their beliefs in the Pawnee Star Chart & Astrology. How was an Earth Lodge built? The Earth Lodge interior included a central fire pit within a central communal area, located between the four main vertical posts, that the Hidatsa tribe referred to as the 'atuti'. The communal area was used for preparing and cooking food and also as a meeting place. The back wall, opposite the entrance doorway, often contained an altar or sacred area. Beds were located on the lodge floor or on ledges and consisted of dried grasses that were covered with animal hides. There was usually one or two storage pits in the Earth lodge to store dried meat, vegetables, and clothing. Personal possessions were stored in the earth lodge, kept in baskets, storage pits or hung from the rafters. The picture is of an 1832 painting by Karl Bodmer (1809-1893) and called "The Interior of the Hut of a Mandan Chief". The buffalo skull on the floor of the Earth Lodge was deemed to be powerful medicine by the Mandan. The painting shows that not only dogs, but also horses, were kept in the Earth Lodge.